Students enrolled in Fairfield University’s interdisciplinary course “The Philosophy and Biochemistry of Food and Eating Practices” ended the fall 2016 semester by taking a literal bite out of their subject matter. 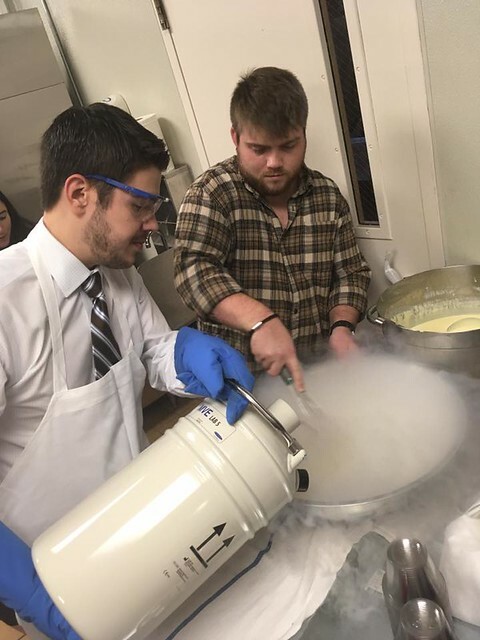 The core science class, which was offered by Professors Jillian Smith-Carpenter and Laura Di Summa-Knoop for the first time this past semester, concluded its course work with an interactive molecular gastronomy demonstration and tasting for students. The event, which was presented in partnership with Fairfield University’s dining services (Sodexo) and held in Faber Hall, explored the idea of “Food as Art” by juxtaposing the aesthetics and biomolecular properties that are used in the art of molecular gastronomy, a sub discipline of food science that blends physics and chemistry to transform the tastes and textures of food. With years of experience and a wealth of molecular gastronomy knowledge between them, Executive Campus Chef Nick Pawlowski and Executive Resident Dining Chef Jim Turner stepped up to the challenge and worked closely to plan a menu that would be fun and engaging for students while incorporating the philosophical intentions and chemical manipulations discussed in class. The result was an interactive, three-course menu that included a balsamic drizzled strawberry and mint appetizer with a scientifically engineered olive oil dust, a main course featuring poblano air (foam) over seared scallops with a corn and cilantro relish and liquid mango sphere, and a bowl of liquid nitrogen peppermint ice cream for dessert. The hands-on culinary experience also included step-by-step instruction from Turner, who discussed the various scientific processes used to create each dynamic dish. In today’s world, food serves as one of the most interesting topics of cultural and scientific discussion, which is exactly what Professor Smith-Carpenter and Professor Di Summa-Knoop set out to explore in their course. The idea for the class, which was poetically conceived by the second-year professors over a glass of wine during a president’s dinner at Bellarmine Hall, was to select a number of approaches to food (eg; “Food as Art,” “Food in Culture” and the phenomenology of food), and tackle them from a philosophical and scientific angle. The result was a core science class that students of any interest level and scientific aptitude could truly sink their teeth into.